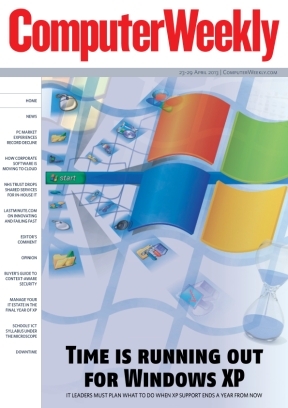 In this week’s Computer Weekly, with less than a year until Microsoft ends support for Windows XP, we examine the options for the many firms still using the popular operating system. Meanwhile, the PC market has seen a record slump in sales as Windows 8 fails to stimulate buyers - what does it all mean for the IT industry? We evaluate the progress that organisations are making in moving software to the cloud. And pioneering online business Lastminute.com talks about managing technology innovation. Read the issue now. Support for the Windows XP operating system ends in less than a year, but many firms still rely on it for vital business applications. We examine the options. Economic pressures, a lack of major IT renewals and the rise of the tablet are all contributory factors to critical time for the industry. More enterprises are asking how they can make the most of cloud, though will this mean a loss of control for IT departments? Lastminute.com director of innovation Bill Beckler talks about creating an environment that nurtures innovation and building a mobile app for travellers. IT leaders must protect against the security risks introduced by the growing interaction between technology and the physical world. In a move that bucks the general trend, Brighton and Sussex University Hospitals NHS Trust has moved away from a shared services IT model to an in-house IT infrastructure based on HP’s converged infrastructure products. Fixing the IT skills shortage is no longer optional. It is crucial to national competitiveness in the 21st century, writes Yva Thakurdas. Education minister Michael Gove unveiled the computing curriculum earlier this year, but some worry it will not deliver the right skills. This week's issue is sponsored by Gartner.